Darren Shearer is a member of the Design Institute of Australia. 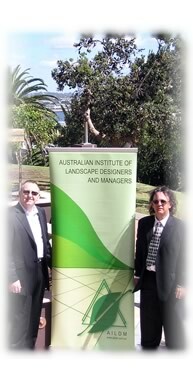 Darren was the first landscape designer in Australia to be admitted to the Design Institute of Australia. He is also a full member of the Australian Institute of Landscape Designers and Managers, and was a former Board member of that Institute. As a sole practitioner, the principal of the Shearmagic Landscape Design, Darren Shearer is able to offer an affordable alternative to larger landscape design practices as the ‘overheads’ do not exist. Darren regularly reflects that his landscape design practice is very low maintenance. He is often heard to say that all he really needs is his notepad, compass, laptop and coloured pens to get his design rationale and message across to the client. This simple philosophy has worked for over a decade for Darren, and is reflective of his style, robust and useable, but sophisticated and elegant. Photo: Darren Shearer left of picture, and his faithful surveyor and friend Bryce Stoddart (Surveyor/Technical assistant) in the contemplation area of the Newcastle Christ Church Cathedral – ‘Immurement Garden’ after winning the 2007 Hunter Landcom Urban Design Awards – ‘The Harper Somers award for Best Landscape Design’ - Hunter Chapter of The Royal Australian Institute of Architects.